The Syrian refugee crisis, which the United Nations High Commissioner for Refugees (UNHCR) has called “the largest humanitarian emergency of our era”, has raised awareness of refugee crises on a global scale and prompted the Dalhousie community to answer a call to action. Dalhousie has a long-standing tradition of supporting refugees and immigrants. Many of Dalhousie’s faculties and student groups have ongoing initiatives to assist refugees settling in the Halifax area. The Faculty of Dentistry provides dental care free of charge to refugees. The Faculty of Medicine, in partnership with ISANS, provides free medical services to incoming refugees. These are just a few examples of how the Dalhousie community has come together to ease the plight of refugees over the years. Our ProjectDal crowdfunding campaign will raise money to support a second refugee student placement at Dalhousie through the World University Service of Canada (WUSC). It will also increase support services for refugee students. Total funds donated by staff, faculty, students, alumni and friends through the ProjectDal campaign will be matched by Dalhousie. We also encourage the Dalhousie community to donate material goods, funds and services to the Immigrant Services Association of Nova Scotia (ISANS) as it provides support to refugees that help ensure their smooth transition into the community. The Dalhousie local committee of World University Service of Canada (WUSC) has sponsored over 50 refugee students since 1981 – usually 2 students per year. Dalhousie partners in this sponsorship include the university administration, Student Union, Bookstore, alumni association and Aramark. The students come from refugee camps where Canadian aid workers and their affiliates have identified them as having sufficient ability and academic preparation to succeed in Canadian universities. The process of selection is highly competitive. In the past decade or so, most of the students sponsored have been Somali and South Sudanese; however, this year one student from Syria was also sponsored. The Dalhousie WUSC committee has been unable to sponsor more students due to financial constraints. Upon arrival in Halifax, the students begin the difficult process of adjusting to a new country and culture, being away from family and friends and new academic demands, with the assistance of the committee members. As the school year goes on, the committee supports students with academics, social events, helping them file their taxes, register for summer classes, put together a CV, find accommodation for the summer and the fall of their second year, as well as try to find part-time employment and fill out student loan applications. 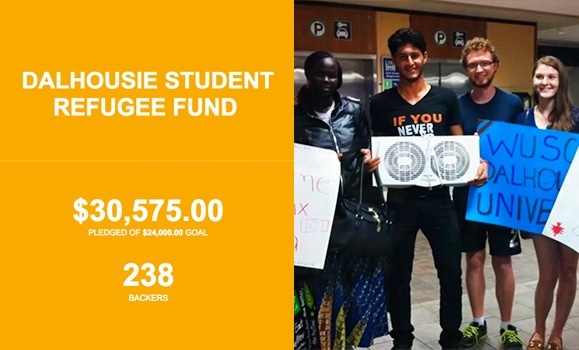 The Dalhousie Student Refugee Fund (DalSRF) campaign has officially come to a close — and the 40-day campaign not only met its $24,000 crowd-funding goal but surpassed it. Thanks to the generosity of the Dalhousie community, DalSRF raised $30,575, which the university will match. Dalhousie will work with its partner organization, World University Service of Canada (WUSC), to best determine how the proceeds from the campaign will be applied to create additional student refugee placements at Dalhousie. Since the campaign launched, individuals and student groups have reached out to the Working Committee on Refugee Crisis (WCRC) and the president asking how they can help further Dal’s efforts in addressing the global refugee crisis. “Students in the Faculty have Dentistry come together to sponsor a Syrian family; the School of Health and Human Performance organized a Dal-wide drive for clothing, toys and household items for refugees; and students and staff have volunteered to donate the proceeds from their artwork to support refugees settling in our area,” said Alain Boutet, executive director of international relations at Dalhousie and chair of the WCRC. Dr. Boutet also cites a $5,000 donation from the Dalhousie Faculty Association (DFA) to the fund as further evidence of how the Dal community has come together quickly on this matter. DalSRF was a starting point for Dal and the WCRC, which is still exploring ways that Dalhousie, as an institution, can expand upon its current services and make long-term sustainable contributions to addressing the refugee crisis. Reported by DalNews as of December 2015.